Clicking on the File menu and selecting New → Interface. Right clicking in the package explorer and selecting New > Interface. Clicking on the class drop down button ( ) in the tool bar and selecting Interface ( ). Before bringing up the New Java Interface wizard, if possible, select the package in which the interface is to be created so that the wizard can automatically fill in the package name for you. Ensure the source folder and package are correct. Click on the Add button to select the extended interfaces. Select the Generate comments check box if you like comments to be generated. 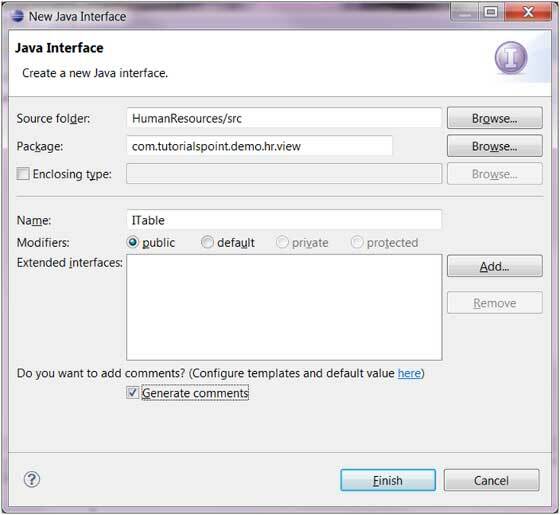 The newly created interface should appear in the Package Explorer view and a java editor instance that allows you to modify the new interface should appear in the editor area.